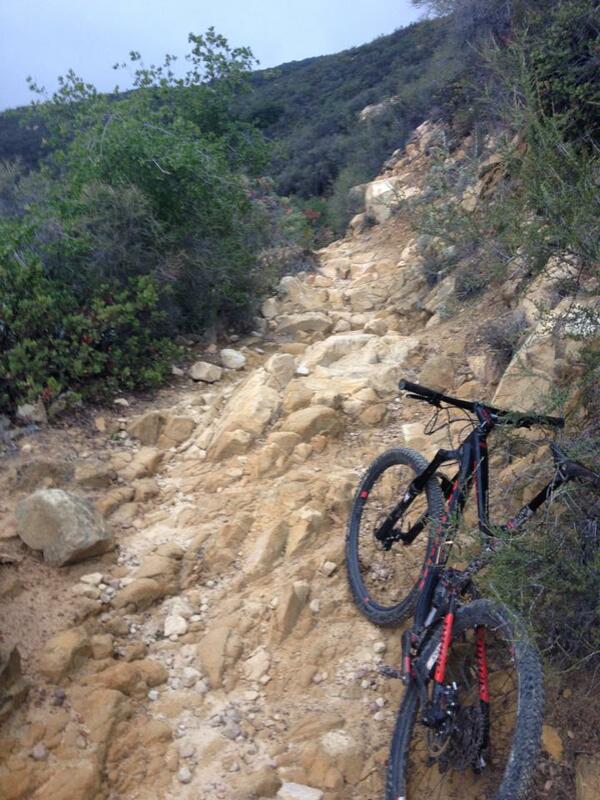 A comprehensive compilation of hiking and biking trails in Santa Barbara County. After moving to SB in December 2014, it has taken me many hours of going the wrong way up trails that are impossible to bike up to figure out where all the trails are, which direction to take them, and how to connect them all into fun loop. Updated frequently as I find more good dirt. NAVIGATIONAL NOTE: The coast here is oriented WEST TO EAST!!! Not N-S, like we are accustomed to in California. I'm a pretty competent rider, so normally I don't pay much attention to trail ratings. But as soon as I started exploring my new home trails in SB, I wished some kind of rating system was available to me. For starters, the vast majority of the trails here are barely rideable on a hardtail, and that is coming from a pro XC racer who rides his hardtail all over the USA every weekend. And without a combination of fitness and technical skill, the vast majority of front country trails are near impossible to climb without lots of hike-a-bike, and I don't use the word "impossible" in a hyperbolic way. Linking these trail together in a couple of good loops ended up mostly being a matter of finding which trails were at all possible to pedal up. Figuring that out has meant riding all the trails in the wrong directions, a tedious and shoe-destroying process that I hope to help others avoid with the maps in this blog post. Knowing that upper Cold Springs is not a "climbing" trail is key info. The ranking system I've applied is a modified version of one used on a classic Bay Area trail map I remember my dad having in the mid nineties: arrows point in the uphill direction on each trail segment, and the number of arrows indicates difficulty. 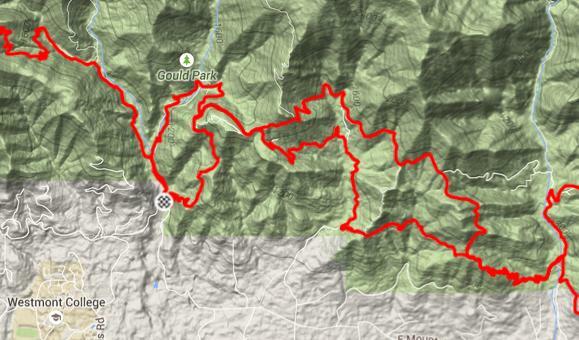 >>> = Insanely steep fireroad and absurdly technical singletrack. In the Bay Area, we call these "rock gardens". In Santa Barbara, I call them "climbs that are possible to clean", with expert skills and fitness. This is everything short of riding up rock stairs. >>>> = Not possible to climb. Alternately, these are World Cup Downhill worthy descents. It is absolutely not possible to pedal up significant portions of these trails. Be warned, both up and down. Starting in downtown Santa Barbara, a very challenging network of trails reaches into the Santa Ynez Mountains and Los Padres National Forest backcountry north of town. 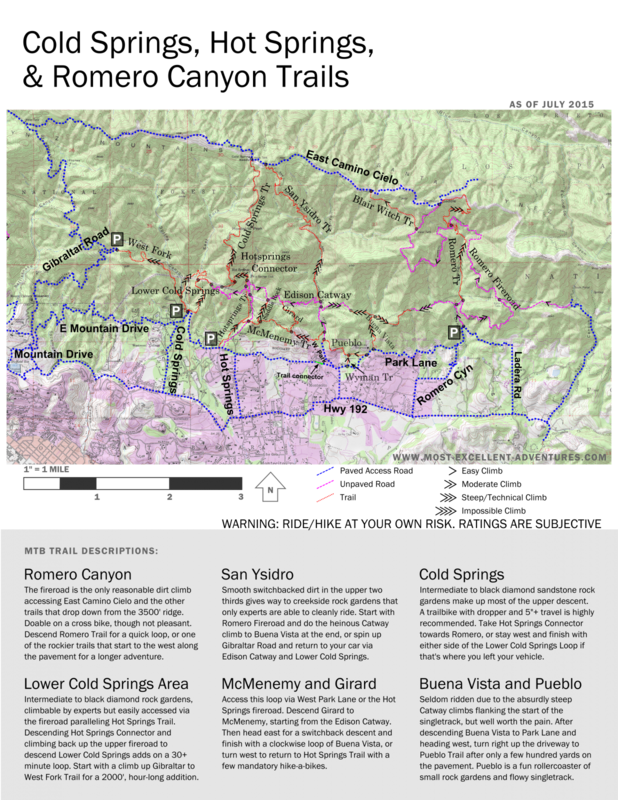 Romero, Cold Springs, and Hot Springs are the the three main artery trails that extend all the way up to East Camino Cielo, the paved road that runs along the ridge of the front range. Together with Gibraltar Road and Tunnel Trail, they provide access to the back country and also host a small lower network that allows for shorter rides with more frequent climbs and descents. Click the map image to download a PDF, or the Strava image below it for a segment I have created that I feel is the best all-in-one tour of everything the lower front range trails have to offer. The Lower East Front Range All Dirt Tour Ride.